Gallery > Sega Genesis CD | Added a new fan art by Shinobi. Archive > Sega Force BG0 | An original prototype background image. Gallery | Added 7 new classic images from the Sega Force archives. Today is the tenth Anniversary of Sega Force online. Forum > You Are "Having Nightmares" If... | A wise man once said, learn from your mistakes. News > 10.04.1998 | The Sega Force News archive begins today with the addition of 6 articles. Forum > You Are Mass Market If... | Could this be you? Fear not, the Force is with you. Forum > You Are Kiddie If... | It's all in good fun so take it lightly. Archive > Animated Gifs | Added: Sega Saturn 2K2. Archive > Backgrounds | Added: Sega Force BG1 and Sega Force BG2. 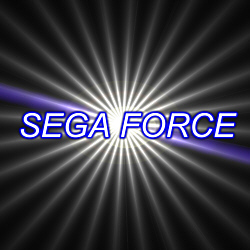 Archive > Animated Gifs | Added: Sega Force Blue. Forum > An Interview With Various Gamers | Expanded! Remember, this is supposed to be funny. 1997-2019 Sega Force. Sega Force is not an official Sega company website.